The paintings shows the suffering of Jews and Jesus. Violent conflicts are depicted such as the setting on fire of synagogues. In the center of the picture Jesus is displayed, crucified and symbolized as being Jewish adorned in a prayer shawl. 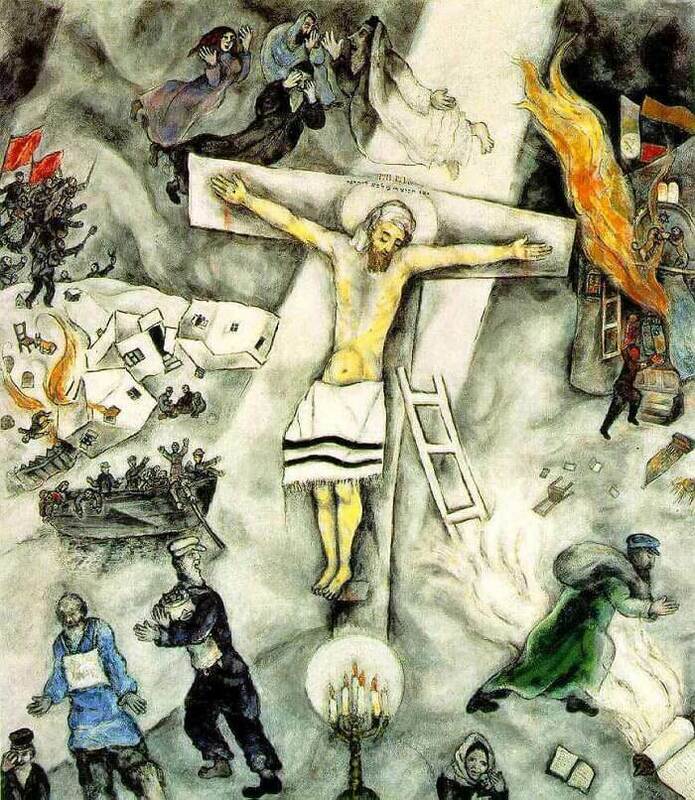 In White Crucifixion, his first and largest work on the subject, Chagall stressed the Jewish identity of Jesus in several ways: he replaced his traditional loincloth with a prayer shawl, his crown of thorns with a headcloth, and the mourning angels that customarily surround him with three biblical patriarchs and a matriarch, clad in traditional Jewish garments. At either side of the cross, Chagall illustrated the devastation of pogroms: On the left, a village is pillaged and burned, forcing refugees to flee by boat and the three bearded figures below them - one of whom clutches the Torah - to escape on foot. On the right, a synagogue and its Torah ark go up in flames, while below a mother comforts her child. By linking the martyred Jesus with the persecuted Jews and the Crucifixion with contemporary events, Chagall's painting passionately identifies the Nazis with Christ's tormentors and warns of the moral implications of their actions. Together with Pablo Picasso's Guernica, the White Crucifixion is one of the most eloquent condemnations of war and hatred of the 20th Century. The original painting is currently being exhibited in the Art Institute of Chicago.